Bryant Park is a public space controlled by a private corporation. Owned by the city, everything that happens in the park happens at the behest of the Bryant Park Corporation. The main lawn only functions as truly open and public for a small percentage of the year. At other times it is used for Fashion Week, corporate events, private galas, etc. During the Christmas season the lawn is turned into a tent-enclosed shopping mall centered around an ice rink. Probably the number one occupation of the park is by construction crews – the space is converted so often, from lawn to catwalk to mall to stage to theater and back again, that it is constantly under construction. On the main lawn of Bryant Park, the only park in midtown Manhattan, scheduling is tight; indeed, time is at a premium. Events [and their preparations] take up so much of the year that less and less time is available for the public. 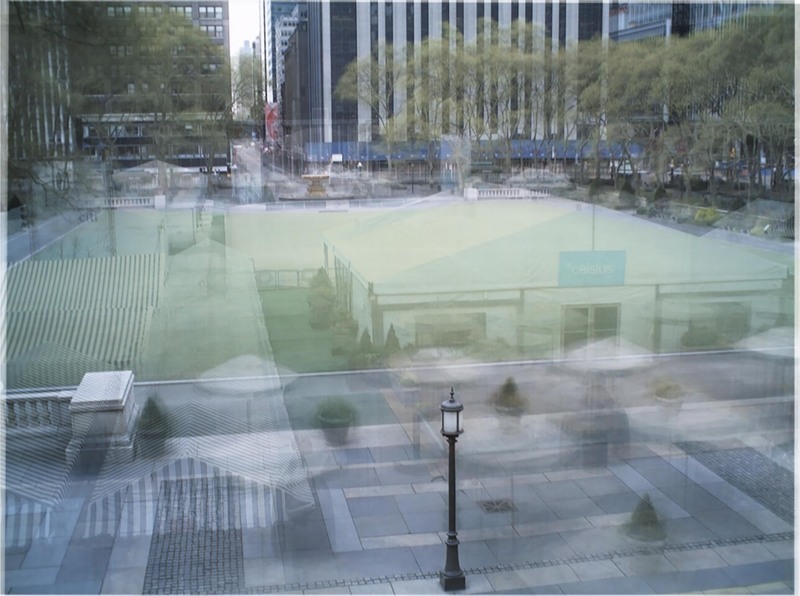 The images compiled here are averages of photographs culled every ten minutes from the Bryant Park webcam from 29 September 2006 to 1 October 2007. The ‘day’ and ‘week’ images are simple arithmetic means, in which each pixel in the final image is an average of the RGB values of the matching pixels [ie the pixels with the same coordinates] across the set of images. The year image is also the result of an arithmetic mean, but due to small movements of the webcam over the course of the year, each of the individual images was first realigned to increase clarity. Average Bryant Park was published in Pidgin 4.